Every Thursday, a Scripted writer will recap a session from Content Marketing World 2014 that will be published here on the CMWorld blog. Find out more about Scripted by visiting their website. “Does writing even matter anymore in a world where ’13 Potatoes That Look Like Channing Tatum’ gets 2,000 tweets and 14,000 shares on Facebook?” That’s the hard-hitting question Ann Handley, Chief Content Officer of MarketingProfs, asked the crowd at the beginning of her Content Marketing World 2014 presentation. Handley says words are a company’s ambassador — from composing a blog post, filling an infographic to providing personality for a video. In fact, words matter so much that in a survey of the industry’s most effective content marketers, 65 percent said they wanted to become stronger writers. A similar number wanted to become better storytellers. For less confident writers (or, as Handley calls them, “adult-onset writers”), writing isn’t an art; rather, it’s a habit that improves with practice. Also, writing isn’t just about grammar and punctuation; it’s about great storytelling. Most importantly, it’s about good thinking. The more marketers write, the better they’ll think. She suggests five keys that will help marketers to become better writers and, by extension, better thinkers. Once they’ve repeated the “So what?” questions until the answers become difficult to generate, they should group their “Because…” statements to form a coherent mission statement for the writing that frames the customer as the hero. Then, after crafting a good content mission statement, Handley suggests pasting the statement at the top of the page. The statement will remind marketers of the content’s ultimate purpose throughout the writing process. Handley paraphrases author Steven Pressfield, who compares writing to downhill skiing: “You don’t break your legs, and you don’t snap your spine, but you need to write with that same kind of recklessness.” Instead of choosing bland, generic, timid writing styles, businesses should create content that reflects their company DNA and culture. Most content marketers create content for a series of personas. Handley suggests imagining an audience filled with people who fit the persona, and then writing to just one person in that audience. She shares advice from her journalism education: Be specific enough to be believable, but universal enough to be relevant. When marketers see the chance to tell relevant and inspired stories or the opportunity to share useful information, they’ve encountered a content moment. Handley says to emphasize empathy and experiences instead of volume. In content marketing, words only matter when they’re about the customer. If fledgling companies can’t give customers cash prizes, free vacations, or new cars, they can still inspire and impress them in everyday places. The best marketing writers look for ways to delight their readers by sharing a relevant story, solving a problem or delivering an emotionally resonant experience. Every piece of content produced should be a gift to the reader. Words are relevant to everyone, even in a highly visual world. By following Handley’s advice and by writing more frequently, marketers will transform their words from unremarkable to unforgettable. Ann Handley was recently on Pamela Muldoon’s podcast, Content Marketing Next. Listen to Ann talk about writing – and writing ridiculously well. 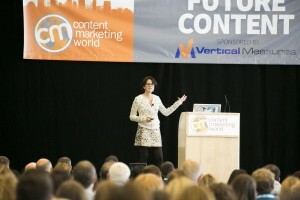 It wouldn’t be a Content Marketing World without Ann Handley on the speaker list. Be sure to register today, before the May 31 Early Bird pricing goes away! And as an added bonus, use code CMI100 to save an additional $100 off. Scripted provides high-quality, original content for a flat rate with a set turnaround time. Post guidelines for what you need, and five days later you’ll receive professionally written and edited content.